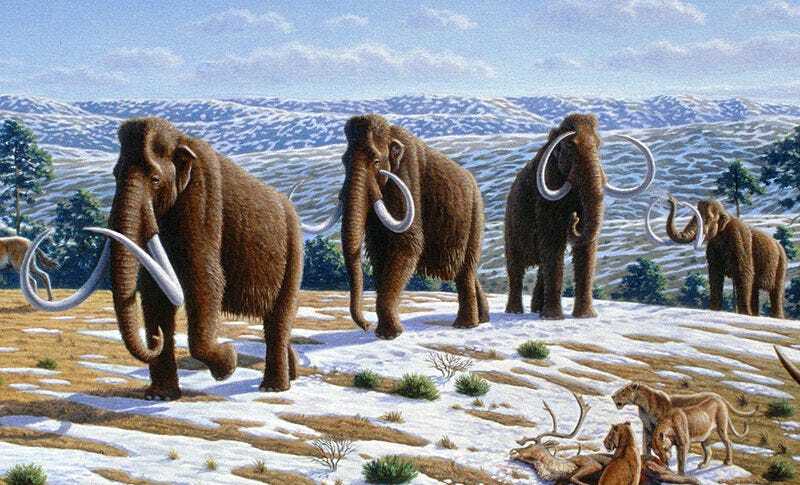 The extinction of the mammoths in Eurasia occurred at the end of the Pleistocene. They didn’t die alone. A lot of different megafauna, including cave bears and giant sloths, went extinct at roughly the same time. There are plenty of theories on why mammoths went extinct: climate change, disease, geological upheaval, or being hunted by humans—but a new theory says the ground is responsible. Russian scientists have discovered mammoth graveyards where the mammoth skeletons have sustained damage that wasn’t caused by trauma. No matter what their age, these mammoths showed signs of softening, scarred, or brittle bones. In two caches of mammoth bones, 90% of the mammoths suffered from osteoporosis. Sergei Leshchinsky, of Tomsk State University, believes this is because they lacked the minerals they needed to sustain healthy bones and, probably, muscles as well. The sudden lack of vital nutrients didn’t come from a reduction of plant life—it came from a change in the ground beneath their feet. There are specific areas where animals gather to eat clay, or drink muddy water. The dirt in these areas tastes salty, and is full of sodium, magnesium, calcium, phosphorous and other minerals necessary to keep the body going. They look the same as any other patch of dirt, but chemically they are watering holes in a vast mineral desert. In the late Pleistocene, these oases were disappearing. Rising seas flooded the low-lying areas, and heavy rains washed the minerals out of the soil in the high areas. For huge animals, dependent on large stores of minerals, the end of the availability of these invisible troves of minerals could have meant a slow death. Although the mammoths seemed to have everything they needed, they starved.